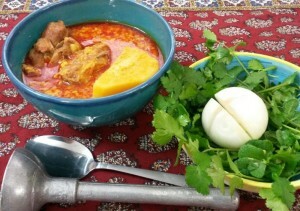 Abgoosht is one of the most traditional Iranian foods. 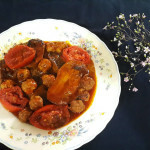 It is also called Dizi, which refers to the traditional stone crock pots it is served in. 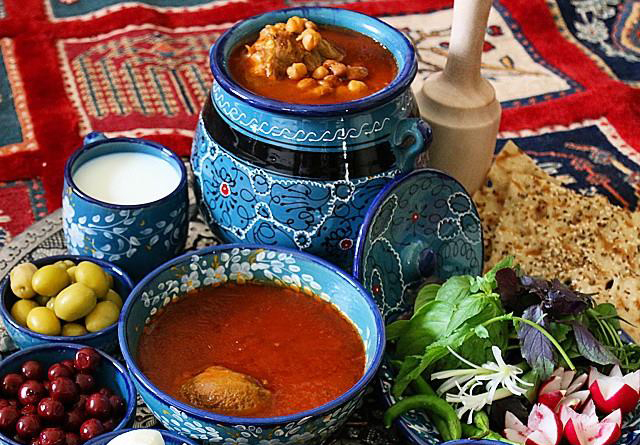 Hundreds of years ago Abgoosht was made with lamb and chickpeas. 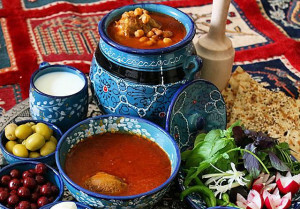 However, later on when new foods such as potatoes and tomatoes were introduced to Iranian Cuisine, the recipe had some changes. Serving Abgoosht has a special custom. First the broth is poured in a bowl and served with small pieces of bread soaked in it. 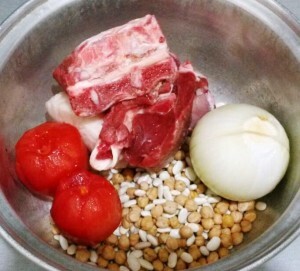 Then the remaining ingredients such as potatoes, beans, chickpeas and lamb are mashed up to a mashed-potato type consistency and served separately alongside with the broth. 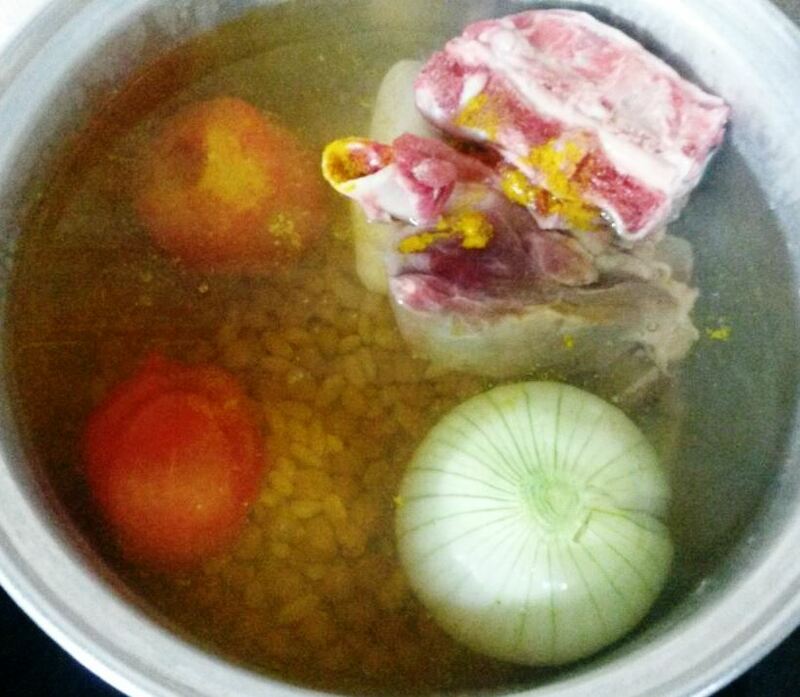 Place the meat, onion, chickpeas, beans and peeled tomatoes in a large pot. Place the pot over medium heat. Add turmeric and 5 cups of water and bring to a boil. Cover and cook on low heat for one to two hours. When meat is almost cooked, remove the tomatoes, onion and any fat from the meat and place them in a bowl. 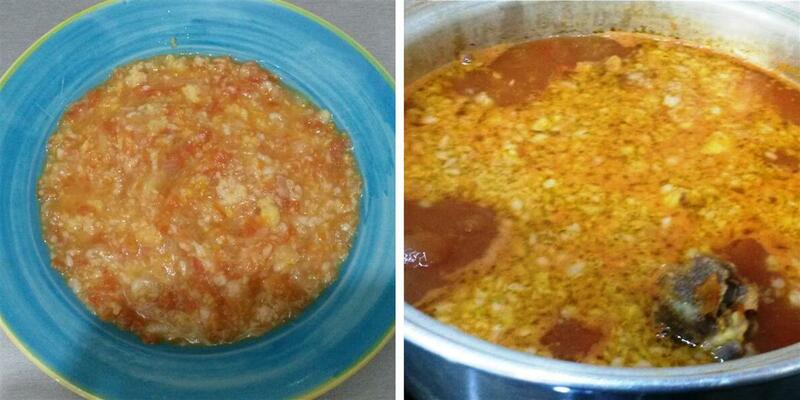 Using a blender or meat masher, mash the onion, tomatoes and fat. Add it to the pot again. Add salt, pepper, tomato paste, potato and lemon juice. Cover and continue cooking for another hour. 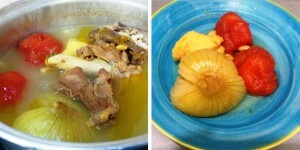 If necessary adjust water and keep cooking until all the ingredients are fully cooked, taste and adjust the seasoning. Serve warm with bread. Thanks for the receipe . 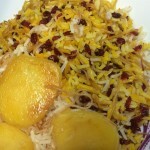 I like Persian food so it is very helpfull to me to cook Iran food in home and enjoy . 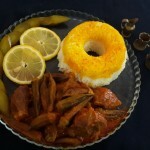 I love Persian food, thank you for the recipe . I used my pressure cooker…ready in about 40 mins; counting prep time. Sorry, I stick to the old flavours. The potatoe and the tomatoes are definitely misfits in this recipe. The mashed potatoe gives the wrong texture and the tomatoes convey the wrong taste. The tumeric doesn’t help, either, because of the wrong colour. I added half a leaf of finely chopped kaffir lime for to achieve the lemon flavour. As I remember from pre-revolutionary Persia, Abgoosht is very dark and deliciously intense. Unfortunately, although it is screaming for a good red wine to go with it, in Iran they wouldn’t serve any. Tried this recipe and it came out really good!!! Thanks for sharing the recipe. 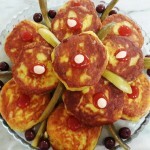 I want to thank my Iranian friend for sharing the recipe. I read the reviews and I cant wait to cook and eat. Once I’ve tasted it I will give 5 stars for sure as it looks sooo good. 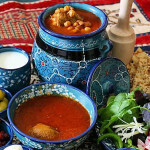 I love Abgoosht. I have tried this dish from all over and consider myself an expert when it comes to eating it. Of course this recipe gets 5 stars right of the bat. Now I like to share something very incredible. I had an abgoosht cooked by a vietnamese lady and it just blew me away. The best tasting abgoosht ever. I tried to get the recipe but no luck. I am going to enter her in a contest hopefully in Iran. It was so good that I ate it all. Now looking back I should have saved a bowl to prove the point. 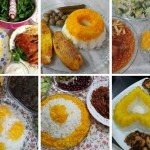 I am very picky about persian food in general. But this time I was speechless. 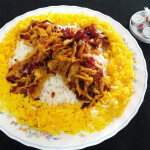 Imagine that, persian cuisine from vietnam with love.